A big game animal must immediately be tagged when taken. The tag shall be placed on the carcass in a location that is open to view and shall remain there during possession and transportation, until the animal is cut up for consumption. Either a paper tag or durable tag may be used. Any tag used must include the information (name or Conservation ID number) on the tag identifying the person that took the animal, along with time and date of kill, before transporting the carcass. A person taking big game shall within 48 hours report the taking and exhibit the carcass to the nearest game warden, official Fish & Wildlife Department Reporting Station, or to a person designated by the commissioner to receive the reports. Bears must be field dressed prior to reporting. No big game carcass shall be transported out of state without first being reported. Proper management of big game populations requires the collection of critical biological data that is used to estimate the size and health of the populations. Successful hunters need to make every effort to provide this information when reporting a big game animal. It is illegal to transport big game taken by any illegal means, or taken in closed season. Deer do not need to be visible when transported. A person shall not transport game taken by someone else unless the person who took the game accompanies it. All other regulations regarding the transportation of fish or game apply to the transportation of big game. Transporting parts of big game is prohibited unless the parts or the package containing them are marked with the name and address of the person who killed the animal(s). 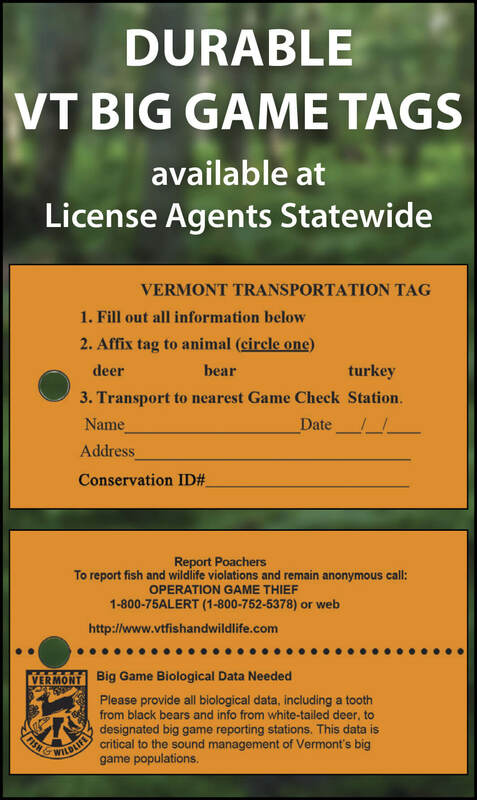 In order to legally transport into Vermont and possess big game that was legally taken in another state or country, a person must keep the tag that is required by the state or the country where the big game was taken. Each package of meat must be marked with the name of the person who took the animal, tag number, date, and state or country of origin. Hides or capes with no part of the head attached. Clean skull-cap with antlers attached. Antlers with no other meat or tissue attached. Upper canine teeth with no tissue attached. Other fish or game legally taken in another state or country may be possessed and transported into Vermont in the presence of the person who took that fish or game. The following means of taking big game are not allowed: baiting, snares, traps, salt licks, jacks or other lights. It is illegal to use a dog to hunt big game. Hunters are also prohibited from harboring or possessing while hunting a dog used for this purpose. Exceptions for hunting black bear and wild turkey with dogs are provided in Fish & Wildlife rules. Legally taken big game may be possessed during the open season and for a reasonable time after the season has closed. It is illegal to possess big game taken by any illegal devices or, any big game taken in closed season. Any part of the carcass of legally taken big game may be possessed at any time in cans or in a cold storage locker or home freezer. Optional Vermont Big Game Tags are available free from license agents as durable alternatives to the paper tags on licenses. Optional tags may be used to tag deer, bear, turkeys, or moose. Record your CONSERVATION ID number (top left corner of your license) on the Optional Big Game Tag. A qualifying landowner may use the tag by writing “landowner” in the same space. The existing paper tag that comes with a license may also be used. Optional Big Game Tags may only be used by a person who has purchased the appropriate license and tag for the species they are hunting.